Schneider Optics’ 2/3" compact C-Mount lenses are optically corrected and broadband coated for the spectral range of 400-1000nm(VIS+NIR) on megapixel cameras. They are ideal for applications involving security, machine vision, 2D/3D measurements, traffic control and surveillance, food processing, biometrics, automotive crash testing, and defect detection classification. 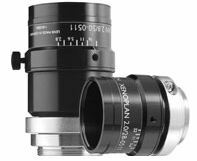 These compact, C-Mount lenses are also ideal for medical, robot vision, packaging, web inspection, and aerospace applications. These 2/3” Compact C-Mount Lenses feature excellent optical imaging performance even with the smallest pixel sizes, precise focusing via fine thread for perfect focus adjustment, industrial strength metal mounting, vibration insensitivity for stable imaging performance, a compact design resulting in low space requirements, and more. These lenses can image properly across the entire specified range without any focus shifts. The robust mechanical design with lockable focus and iris-setting mechanism guarantees long-term stability even in typical production environments. Most of the 2/3” format lenses accept an M30.5x0.5 filter thread, with the exception of the Cinegon 1.8/4.8mm and Cinegon 2.1/6mm lenses that uses a filter adapter to accept an M62x0.75 filter. Compact Series lenses are also available for 16mm and 22mm sensors.